When the Spark came out, many people were excited about it, but there were a lot of people (me included) that didn’t like the quality of the video. There was an even larger amount of people who didn’t like the fact that the arms weren’t foldable. Now the Mavic Air is out, and it aims to solve all of the main issues that people had with the Spark while still being cheaper than a Mavic Pro. If you were on the fence between buying the Spark and the Mavic Pro, you can now buy the Mavic Air. If you’re on the fence between the Spark and the Mavic Air, well this article is for you. Before going into the details, let’s talk about the obvious difference; the dramatically different yet similar design. The Design of the Spark is like the design for a Tesla Model 3. It’s very basic to keep costs down, but it still feels like a premium product and has a lot of technology under the hood. And it comes in some pretty cool colors if you’re into that sort of thing. When it first came out, it was hard to believe how small it was, and to this day, it’s amazing how much tech DJI can fit inside of it for only $399. The outside shell is vary basic, but it’s strong and most people who crash say it’s more durable than the Mavic Pro. Since the Spark is so cheap, DJI had to cut corners somewhere, and one way of doing that was to make the design static (non-foldable). 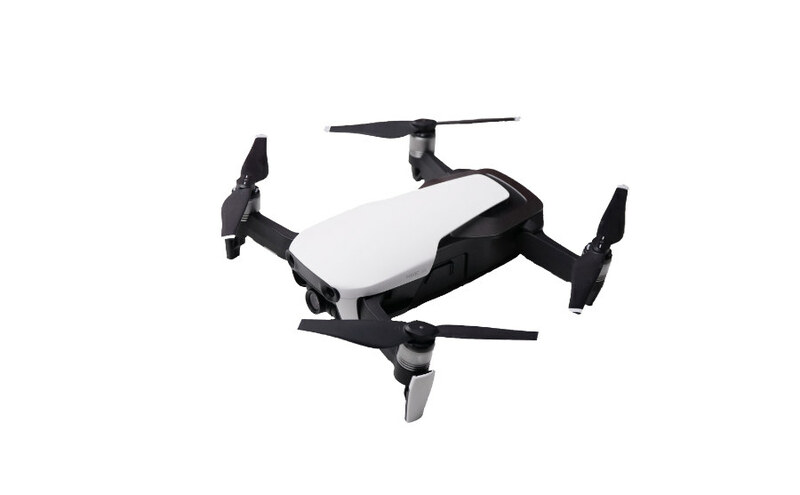 This means that while it is much smaller than the Original Mavic Pro while flying, once the Mavic Pro is folded up, it retains a more compact shape. Another flaw with the Spark is the two axis gimbal. It’s super compact, but with only two axis instead of three, your videos will often have more yaw movement in them. DJI does try to digitally stabilize the third axis, but we all know that digital stabilization isn’t as good as the real thing. With a higher price, the Mavic Air fixes all of these issues. It’s almost just as small as the Spark when flying, but when you fold it up the Mavic Air becomes the most compact drone DJI has ever made. Aside from the insanely small design, the camera has a 3 axis gimbal, so videos come out looking like butter! Another nice feature that most people will probably overlook is the threaded lens filter mount. When you get the Mavic Air, it comes with a screw-on bumper that protects the front glass. Take that off and you will have the option to mount whatever ND filters you want. This may not be a big deal to some, but I like that they included 8 GB memory built-in to the drone. It might be just enough to get a shot or two when you’ve driven off into some far away place only to realize you forgot your memory cards at home. The one thing that I was skeptical about was the landing legs that fold out from the front arms, however they seem very sturdy feeling and provide great WiFi reception. The gimbal cover is also well made. It completely covers the camera and it’s super easy to take off. One thing that is a bit annoying is the non-folding propellers on the Mavic Air. Although it is still compact when folded and thrown into your pocket, the propellers are awkward and have a tendency to stick out a bit. So when you try to take it out of your pocket or backpack, the drone can get stuck and possibly bend your propellers. For this reason, I would buy folding propellers for my Mavic Air. Good news is if you already have a Spark, you actually have folding propellers for the Mavic Air. 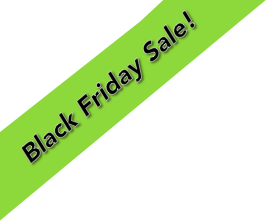 If not, you can purchase them in the DJI Store. When I Received the Mavic Air, I tried installing the DJI Spark propellers on it because I just do things like that. Ha! Guess what? They fit! And they work! One very minor thing to note is that they are smaller than the ones that come with the Mavic Air so your flight time will be reduced. But I tested this out and only lost one minute of flight time. Not that big of a deal in my opinion. Problem solved. Looking at the more subjective aspects of the design, I really like it. From the top, it’s like if you took a Mavic Pro and a Spark and merged them together. Looking at the back of the drone, you’ll notice the unusual sports car styling. This silver metallic strip is nothing but a piece of plastic, yet I love it. it reminds me of the Audi R8. There are many different ways of measuring speed, but to start, I first tested Sport mode since this is the fastest flight mode. In Sport mode, the Spark can go just over 30mph while the Mavic Air can reach speeds over 40mph. In the standard flight mode, regardless of if you’re using the controller or not, the Spark will only go 7mph with obstacle avoidance turned on. Once you turn obstacle avoidance off, the Spark will go about 13mph, but that still isn’t very fast compared to the Mavic Air. Even with obstacle avoidance on, the Mavic Air will go 20mph. Unfortunately, because of the limited range of motion, you can’t actually go full speed without the cameras tilting down or sideways on both of these drones. For example, the spark can go about 20mph in Sport mode before the camera starts looking down, but if you try going sideways in Sport mode, the camera will also roll with the drone. This means that you can only use the standard flight mode to fly sideways and that will limit your speed to 13mph (with obstacle avoidance off). The Mavic Air seems to handle this issue slightly better. Instead of immediately tilting the camera when you fly sideways in Sport mode, you can fly up to 20mph before the gimbal reaches its limit. It’s amazing how much flight time the Mavic Air gets even with the added weight and extra sensors. With the Mavic you can expect 18 minutes of hovering around slowly. The Spark will do about 13 minutes which just isn’t enough in my opinion. Those five extra minutes might not seem like a lot of time, but when you’re looking around for different shots, you usually don’t start getting any great ideas until you’re a few minutes into the flight. A great drone is nothing without a great camera. The Spark is a great drone, but the video quality is subpar in my opinion. It’s ok for the average consumer, but if you’re into filmmaking, you will find all of its limitations pretty quickly. In this section, we’ll see how much better the Mavic Air camera is. Honestly, these results surprised me. 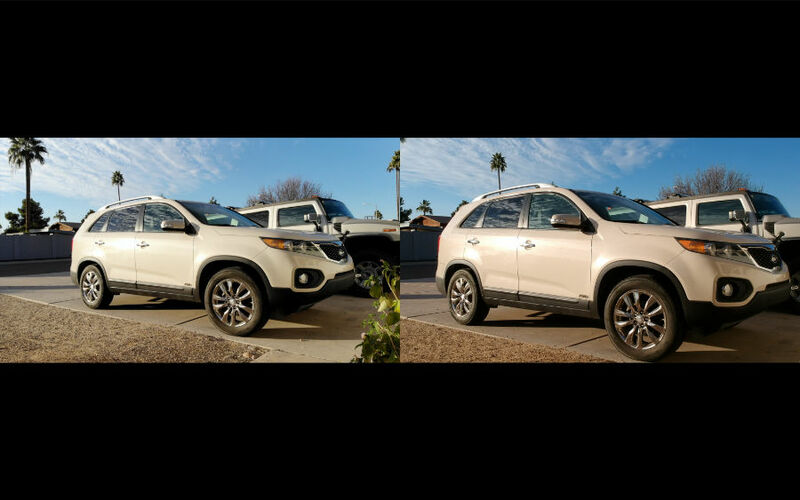 Both of these shots were recorded with the standard picture profile, automatic exposure, and very similar lighting conditions. 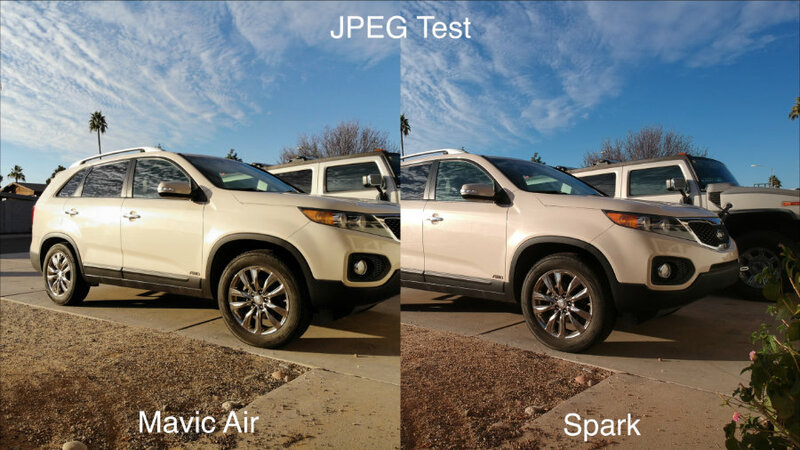 Based on this test, the colors on the Spark appear to be better. There’s no green tint, the black point isn’t too low, and colors look just like they did when I was standing there. 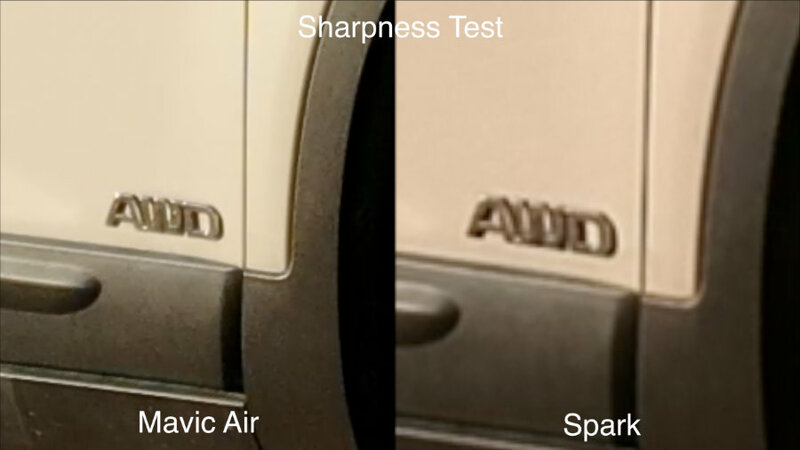 Obviously this isn’t a perfect test since the two shots are slightly different, but even as I compare other shots you will see that the colors on the Spark look the most realistic. Since this is a review unit, there’s a chance that the firmware just needs to be updated, but if not then I’m not sure why the colors on the Spark look so good compared to the Mavic Air. Before you go off and buy a Spark for its color accuracy, there’s one thing I should mention. The colors look great in the standard picture profile, however you don’t get any other picture profiles to play with. This means no Cinelike-D for doing minor color grading and no D-LOG for those more aggressive grades. In this picture, you can see how the Mavic Air has a wider FOV. Both of these drones have a relatively wide FOV, however there’s very little lens distortion. This is where you can really start to see the advantage of 4K video recording. Looking at the AWD on the side of the car, it’s easy to see which side is more readable. Even with the zoomed FOV on the Spark, having eight million pixels vs just two million makes a huge difference. Here’s another example where the colors on the Spark are more accurate. Just like in video mode, The Mavic Air seems to make everything a bit too green. 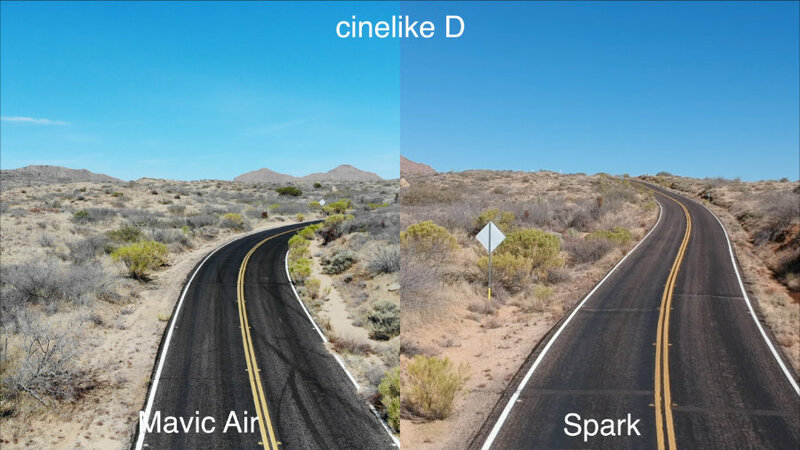 Both of the images are similar in sharpness and compression, but the Mavic Air does have one advantage that photographers will greatly appreciate. With the Mavic Air, you can capture all of your images in JPEG or RAW format. If you don’t like the way the Mavic Air images look, you have full flexibility to process the RAW files and get the exact look you want. The Mavic Air has an upgraded panoramic mode. You can now automatically have the drone stitch a series of 25 photos together to create a full 360 degree spherical panorama that is over 32 MP, or a resolution of 8192 X 4096, higher resolution than the Spark, the Mavic Pro, or Mavic Platinum. Using the DJI goggles lets you take full advantage of this feature in real time for a really cool virtual reality experience. This is an area where these two drones are completely different. Instead of detecting obstacles using cameras, the Spark uses a special IR sensor to detect obstacles in low resolution. The Spark has an IR light emitter which emits a grid of invisible light and a IR sensor that can detect the grid pattern. This allows the Spark to have a general idea of how far it is from obstacles, but it can’t see anything in detail. 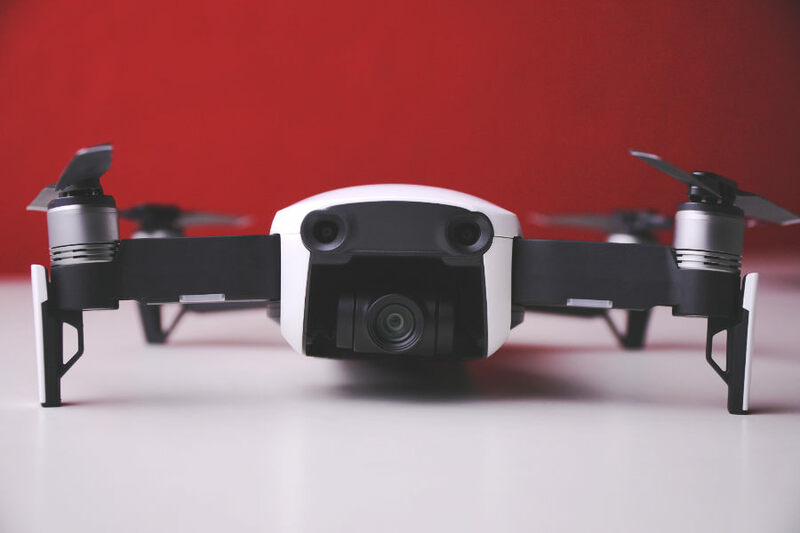 The Spark does have one additional camera mounted on the bottom that it uses for stabilization, but it is not part of the obstacle avoidance sensors. The Mavic Air has obstacle avoidance sensors that work more like the Mavic Pro, but even better. Instead of using IR sensors, there are two cameras on the front that see the world just like a human would. The two video feeds are processed together and turned into a depth map that can be used to detect obstacles. There are also two cameras on the bottom of the Mavic Air and two more on the back. The back cameras work just like the front cameras. They can detect obstacles in almost any flight mode. The two cameras on the bottom are similar to the others, but they are mostly used for stabilization. Once the Mavic Air goes into landing mode, it uses the bottom cameras to check if the landing area is safe. Since cameras are a much more accurate way of detecting obstacles, that allows the Mavic Air to fly much faster than the Spark while still being able to detect obstacles and avoid them. This is why the Spark has a max speed of only 7mph with obstacle avoidance enabled while the Mavic Air can go up to 20mph. Aside from the increased accuracy and backward facing sensors, the Mavic Air has another new feature that will help both beginners and advanced pilots. In the DJI Go app, there is a new button called APAS (Advanced Pilot Assistance System). Once you enable this, you can fly the Mavic Air like you normally would and it will automatically avoid obstacles by going around them (instead of just stopping). If you are flying forward and there’s an obstacle to the right, it will fly left. If there’s an obstacle to the left, it will fly right. If there are obstacles on both sides, the Mavic will just fly up. Other DJI drones can do this while in the Tap Fly mode, but most people don’t use Tap Fly and with APAS, you’re still the one doing all of the flying! If you’ve seen the Spark before, you know that one of its coolest features is Gesture mode. To take flight, it will find your face and liftoff from your palm. To move the drone, you simply move your palm in the direction you want it to go. There are also gestures for taking video and pictures, activating active track, and landing in your palm. Gesture mode on the Spark is cool, but there are a few things that make it annoying for me to use in everyday life. First, not all of the gestures work properly. “Away and Follow” is probably the hardest gesture to get working, and you look like an idiot waving to your drone as it continues to ignore you. Second, since there is no third axis on the gimbal, the subject tracking looks jerky. 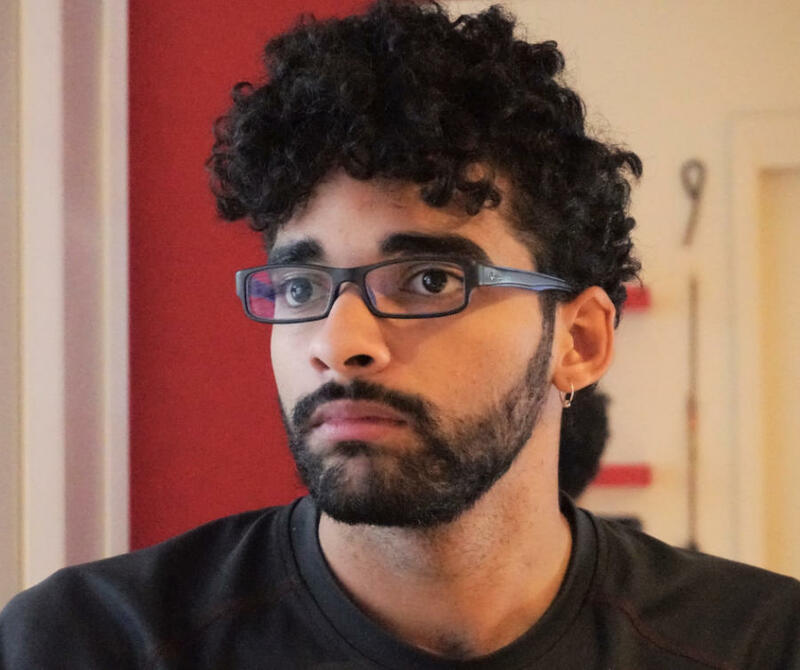 Between that and the lack of 4K, the results you get just don’t look like something I could cut into a short film and create an amazing video with. Gesture mode on the Mavic Air is a completely different story. It’s now called Smart Capture and almost all of the gestures have been replaced or modified for a better experience. To takeoff, instead of holding the drone in your palm and hoping that it won’t hit you, The Mavic Air will takeoff from the ground when it sees your palm. At this point, the Mavic Air will watch you, but it will not follow you or fly backwards until you put your hand up again. Just like the Spark, you can move the Mavic Air with your palm, but once you do, it will automatically start following you after that. If you want it to be farther away, you can do that too. Just put both of your palms out and move them apart. Using this feature, you can have the Mavic Air up to 20 feet away and still have full gesture control. To take pictures, instead of making a frame with your hands, you just hold two fingers up. Making a frame with your hands will now start and stop recording video. One gesture that is completely new is Control Switch. If you want someone else to take control, they can now hold their hand up and the Mavic Air will start tracking them instead of you. With all of the gesture improvements in the new Smart Capture mode, 4K video, and 3 axis stabilization, the Mavic Air takes gesture control to a completely different level. Instead of just being something to play around with, I could imagine myself using gestures on the Mavic Air to make videos that would otherwise be impossible without an experienced pilot. The controller for the Spark is very similar to the Mavic Air. They both use WiFi to control the drone and there’s no telemetry screen like the Mavic Pro controller has, but DJI did make some good improvements. The joysticks now screw off and fit inside of the controller which makes transporting it in your pocket possible. More importantly, the transmission range has been increased to 4km and the controller no longer uses WiFi to connect to your phone. To connect your phone, you just use the included cable that plugs into the side of the controller. This allows you to get a more reliable video signal with less lag and interference than the Spark has. If you don’t have the money for the Mavic Air, I would still recommend the Spark. It takes great pictures, the video quality is ok for a lot of people, and it’s $400 cheaper than the Mavic Air. On the other hand, if you want to make high quality videos, you could always wait, save your money and then buy the Mavic Air when you’re ready. The Mavic Air is DJI’s first drone to be released in 2018. 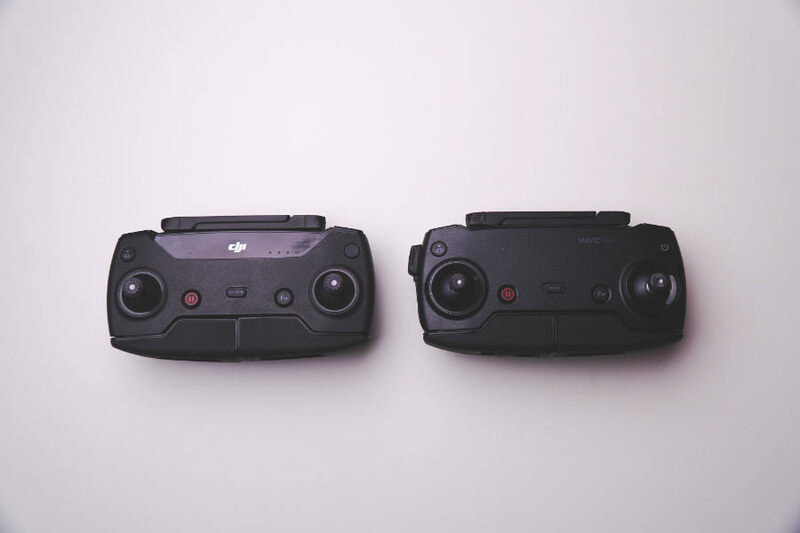 It’s super fast compared to the Spark, the video quality is much better, the controller is better, it’s more compact, it flies longer, it goes farther, and the gesture control is like no other drone out there. If you are even considering spending the extra $400 on the Mavic Air, just do it. For a lot of people, this will be their ideal drone. It beats out the Spark in video quality, beats the Mavic Pro in portability, and provides new features like APAS that will only be seen on DJI’s next generation of drones. 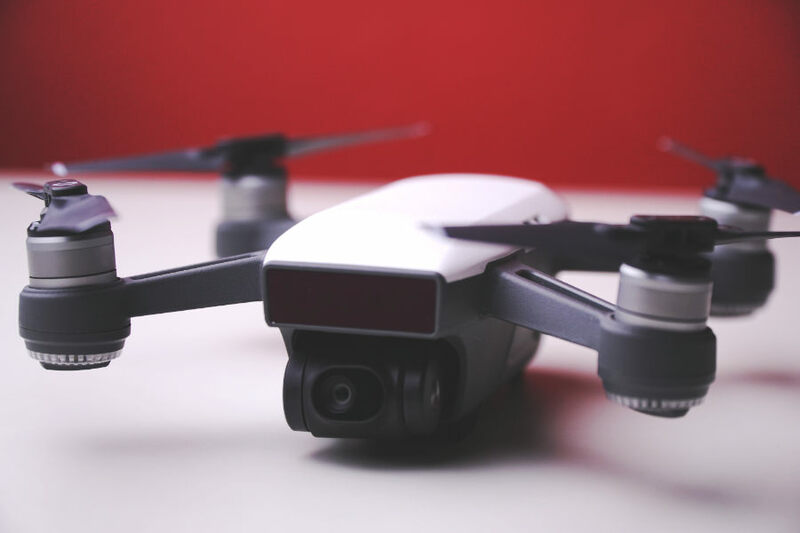 Some people will even prefer the Mavic Air over the Mavic Pro, but if you’re also considering the Mavic Pro, go check out our Mavic Air vs Mavic Pro comparison article.